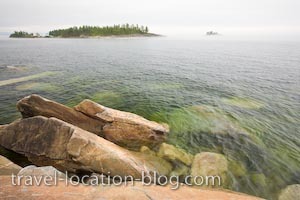 Picture of Lake Superior on a serene foggy day looking out from Agawa Rock in the Lake Superior Provincial Park, Ontario. On a rough day Lake Superior is more like an ocean sporting large swells which smash against the shoreline. Today however, the lake was still and serene, while shrouded in a veil of thick fog just off shore. The slippery rocks along the shoreline seem piled up as though dumped there during excavation of the Lake. Make sure to visit this link for more selected beautiful pictures.